Tema en 'MODs no F1 - Non F1 MODs' iniciado por Sennafan, 7 de Junio de 2016. Konstantin , Mark , Ulf & Tony have released a DTM MOD in 2005 which was updated by them in 2006 . Recently . 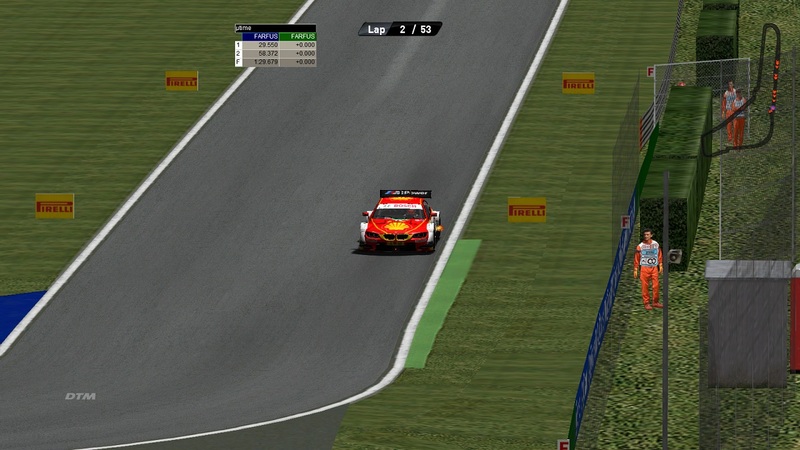 Meteoro has converted a DTM MOD from Rfactor to GP4 which was released as the DTM MOD 2013 . Based on these great works , I decided to make a CSM DTM MOD 2015 , my last contribution to the community before leave the GP4 forever . This is the first version , many things still can be improved by all of you from all the GP4 communities , it doesn’t look 100% perfect to the real DTM but this is the best what I could do . Improvements in the physics , performance .txt , engine sound and CSM configuration must be done I guess . The MOD does not have many kilometers in testing and that's why some bugs are expected . This MOD belongs to the GP4 fans , it means that you can modify it at anytime but always giving the credits to all the authors who contributed in any way to its construction . Don’t forget to ask permission for those who do not agree with the policy of sharing works in the GP4 . I would like to thank all of you who , at some time of the process , pushed me to continue the work . Also I want to nominate the co-authors of the MOD , all of them helped me a lot to solve problems since I started the project : Gezere , Meteoro , Jucksman , AUS_Doug , TurboLover , Superman77 and Phantaman . Finally , again I will repeat here the same thing I already wrote before in this thread : all my thanks and respect to Arnaud ( EXCALIBUR ) who had all the patience and attention with me , pushing me to go ahead despite of my limitations . He is not only a genius doing cars , helmets etc , he is a great man . Here you can find the credits to the authors who support me by giving permission to use their stuff in this mod. Thank you to all of them who have made amazing works for the car racing simulation . Please let me know if I forgot someone or made mistakes related with the author of some work in order to sort all the things out properly . This work would never be released without the original work made by Ales Ogrinc ( United Racing Design (URD) ) and Speedracer1893 ( Racedepartment ) and without the Gpxpatch by Rene Smith (SDI) and and Gp4builder by Lo2k . Hope you like and have fun . 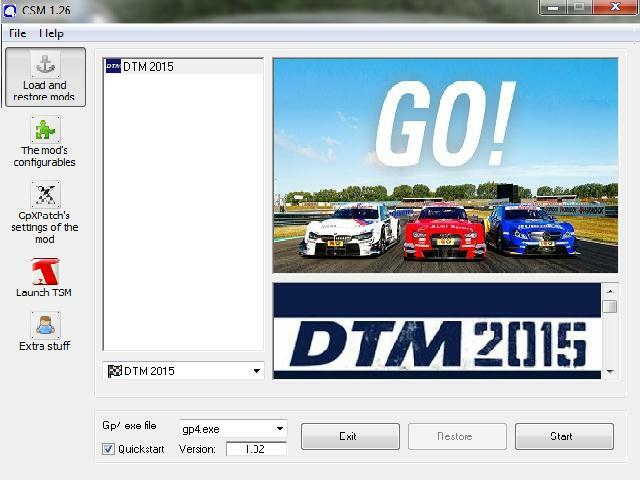 DOWNLOAD DTM MOD 2015 version 0.1 : Por favor, inicie sesión o regístrese para ver los enlaces. This is an update of the DTM MOD 2015 . The difference between this MOD and the one which was released previously is the cars with backfire . There are 2 different CSM.ini , one for cars with backfire ( dry condition ) and the other without backfire ( wet condition ). 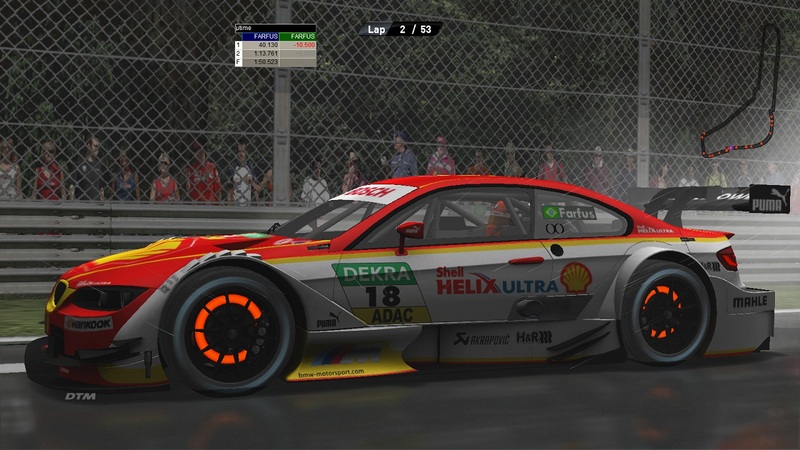 The option "DTM without backfire" ( DTM 2015_1.ini ) can be used in dry and wet weather conditions while the option "DTM with backfire" ( DTM 2015.ini ) can be use only in dry weather conditions . 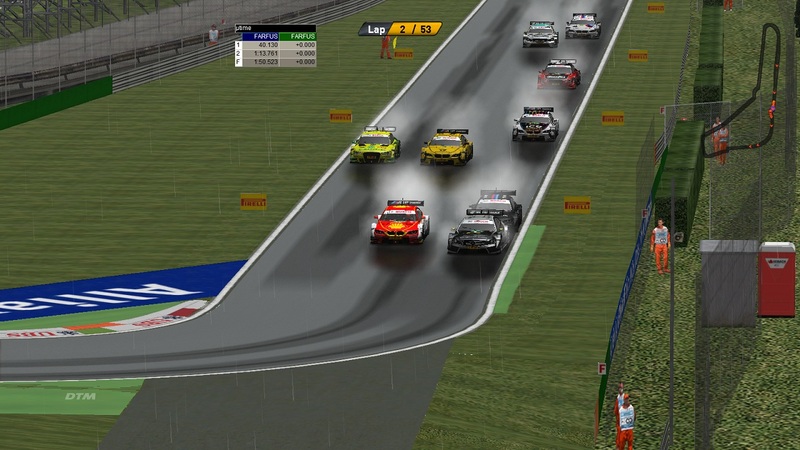 DOWNLOAD DTM MOD 2015 version 0.2 : Por favor, inicie sesión o regístrese para ver los enlaces. This is a second update of the DTM MOD 2015 . The main change is the modification in the CSM configuration according to the magic touch made by Kedy89 ( Toby ) . Now there is only one CSM.ini and the choice for having backfires or not should be done directly in the CSM menu . Thanks to Kedy89 for his help . 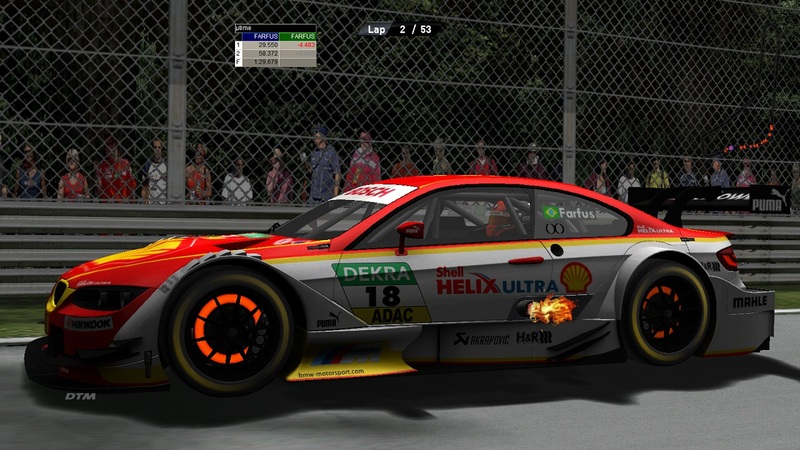 DOWNLOAD DTM MOD 2015 version 0.3 : Por favor, inicie sesión o regístrese para ver los enlaces. jcaranti, gitanes, phantaman y 2 otros les gusta esto. I didn't know about any issue . Anyhow , I will remove the link . MOD updated in the first post . Happy Christmas Season to you all!